Durham, often called the "City of Medicine" for its outstanding medical facilities, was incorporated in 1869. The city was named for Bartlett Snipes Durham, who donated land to build a railroad station. In 1881 the General Assembly created Durham County out of Orange and Wake Counties, and Durham became the county seat. Previous to that, Durham had begun to develop as the site of thriving tobacco manufacturing facilities. Tobacco, in fact, drove the economy of Durham, home of the Duke-controlled American Tobacco Company and its successor enterprises, for nearly a century. Beginning in the 1950s, the city's tobacco economy began to falter, as automation reduced the need for employees to prepare, blend, and flavor tobacco or tend machines. Medical findings about the health hazards connected to smoking also played a part in the weakening of Durham's tobacco industry. In addition to tobacco production, some other types of manufacturing have contributed to Durham's economy, including the making of textiles, pants, boots, hosiery, and soap. Banking and finance also rose to prominence in the city. The North Carolina Mutual Life Insurance Company, the first black-owned insurance company in the state, has been an important Durham business concern since its founding in 1899. The emergence of Duke University (whose precursor was Trinity College) as one of the nation's leading institutions of higher learning, complete with its world-renowned Duke Hospital facilities, greatly enhanced Durham's reputation and economy. Durham is also home to North Carolina Central University and Durham Technical Community College. The North Carolina School of Science and Mathematics was founded in Durham in 1980 as the nation's first state-funded residential high school for academically talented students in scientific fields. Durham has been one of the state's cultural, as well as educational, medical, and commercial, centers. In the 1920s and 1930s, the city gained renown with a strain of the blues known as Piedmont blues, distinguished by its ragtime rhythmic rapping of a washboard and punctuated by the whoops and calls of the harmonies. Today, many organizations are supported by the very active Durham Arts Council, which in September 1988 celebrated the completion of a $5 million renovation of the former Durham High School into the Royal Center for the Arts. Another renovated performance center, the Carolina Theatre, in addition to screening classic, foreign, and critically acclaimed films, hosts concerts, operas, dramatic productions, film festivals, and other special events. The American Dance Festival is held each summer on the Duke University campus. The North Carolina Museum of Life and Science features numerous exhibits, devoted to everything from prehistory to space exploration, and offers interactive, hands-on displays of science and technology, many specifically directed toward children. 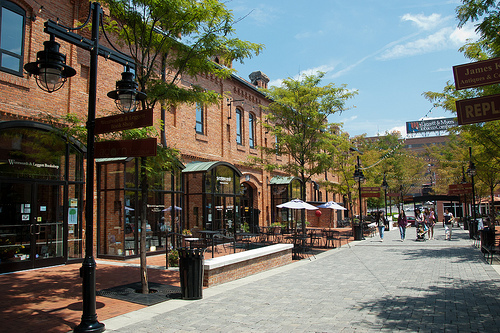 Important historic sites in or near Durham include Historic Stagville (on what was once one of the South's largest plantations), the Duke Homestead and Tobacco Museum, and Brightleaf Square and the American Tobacco Historic District-former tobacco warehouses that have been turned into office, shopping, and dining complexes. In 2005 Durham was North Carolina's fourth-largest city, with a population in excess of 200,000. Wyatt T. Dixon, How Times Do Change: A Series of Sketches of Durham and Her Citizens (1987). Joel A. and Frank A. Kostyn, Durham: A Pictorial History (1978). George E. Lougee, Durham, My Hometown (1990). Digital Durham (website). Duke University. 2001 - 2006. http://digitaldurham.duke.edu/ (accessed March 14, 2013). Search results for Durham > Durham (Durham County, N.c.), North Carolina Digital Collections, NC Department of Cultural Resources. 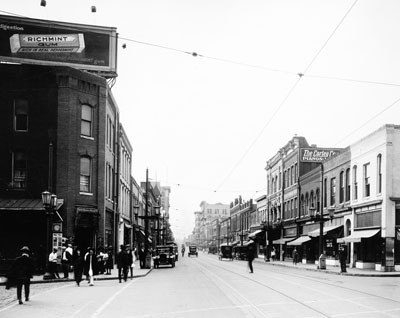 "Durham, NC, c.1912, Main Street, looking west." From Carolina Power and Light (CP&L) Photograph Collection (Ph.C.68), North Carolina State Archives; call #: PhC68_1_25. Available from http://www.flickr.com/photos/north-carolina-state-archives/2344543463/ (accessed December 3, 2012). Rogers, Eric Allix. "Brightleaf Square." Brightleaf District, Durham, NC, US, July 5, 2011. Available from: Flickr Commons, http://www.flickr.com/photos/reallyboring/5921327210/ (accessed December 3, 2012).